Script Batch XMLA Commands Using T-SQL - bzzzt! 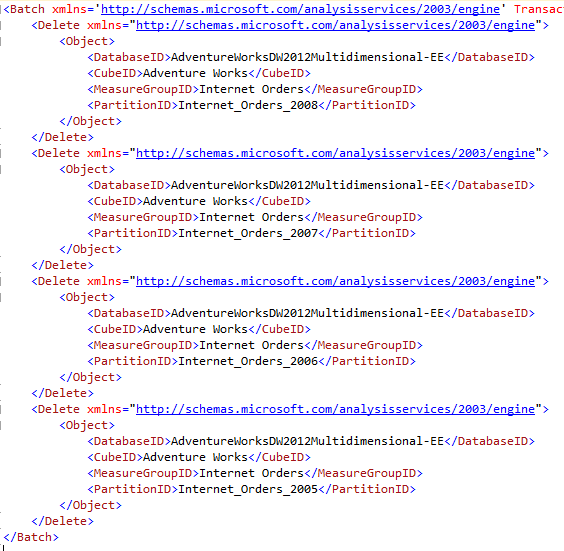 I’ve created an example using the Adventure Works 2012 enterprise cube that has partitions already created. Beneath the code I have some screenshots showing the script in action. The SELECT statement used for the cursor was taken directly from the partition; the Internet Order partition is partitioned by year on the OrderDateKey column in the dbo.factinternetsales table. So to modify this for any partitions you want to drop in your own cubes you need to alter the cursor in the FOR SELECT statement and the xml nodes for the Database, Cube, MeasureGroup and Partition. So say we decide to delete the 5005-2008 partitions for whatever reason. Using the script above, we can create the batch delete xmla. Refreshing the Object Explorer will show that the partitions have been dropped.